WHEN TWO IS GOOD COMPANY: It takes pluck and a certain wraparound vision to make a good artistic go at the drums-and-saxophone format. Exhibit A in this rare field of jazz/experimental enterprise was John Coltrane’s inspired dialogue with Rashied Ali toward the end of Coltrane’s life, captured on the ecstatic LP Interstellar Space. Another current model is the intriguing hook up of drummer Billy Mintz and saxist John Gross, who play at Muddy Waters tonight (Nov. 12) as part of the monthly Santa Barbara New Music series. An artist clearly deserving greater recognition, Mintz was born in New York and is again based there after many years as one of Los Angeles’ most fascinating “out” jazz players. He has written books-including the aptly named Different Drummers-and has played in more conventional jazz settings, including work with Charles Lloyd and Alan Broadbent. 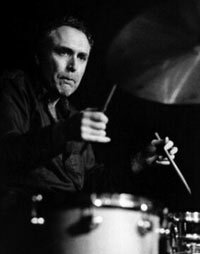 But Mintz’s main contribution to jazz culture has been as a drummer of uncommon experimental verve and free-thinking elasticity. Like Paul Motian and other deceptively low-key drummers, Mintz keeps his cool while venturing expressively outward and inward, simultaneously. He also likes to change up presumptions about instrumentation, performing solo or in his chord-less nonet, the Two Bass Band. And as heard on Beautiful You (Origin), his 2004 duo album with Portland-based Gross, Mintz settles easily into the drums-saxophone model, with poetry and power to spare. BLUES CRUISING AND MUSING: Rod Piazza plays blues harp with the best of ’em, and has for 40-plus years. Hailing from Riverside, California-a hotbed of surf rock in his formative years of the early ’60s-Piazza heard and heeded the blues call early on, and keeps the faith. When he appears at Warren Hall on Saturday (Nov. 14) with his band The Mighty Flyers-including his Otis Spann-style pianist wife, Honey-it will be his first S.B. show hosted by the venerable Santa Barbara Blues Society since that organization’s early days in the late ’70s. In its infancy, the Blues Society had a happy home venue in Claire Rabe’s beloved old bohemian haunt, Baudelaire’s, down on lower State Street by Whiskey Richard’s current locale. Shuffling between venues throughout the years, including nice stints at Victoria Hall and Casa de la Raza, the society’s “meetings”-raucous excuses to dance, carouse, and bask in true blues culture with some of the blues world’s finest-have taken place in Warren Hall. It feels like a proper place to do blues bidding, there in the rustic and anti-slick compound of Earl Warren Showgrounds. Periodically, acts such as Piazza, from the seminal era of the Blues Society’s long life, show up for encore appearances here, attesting to the sturdy continuity of both the music and the hosting organism. Piazza’s music, rooted in the boogie-ing vein of Chicago and West Coast blues, is a timeless thing. Others in Piazza’s peer group went down more musically commercial and pop culture-kissed routes, or got out of music. But Piazza has prevailed, continuing to win love and respect in the blues scene, and recording strong, no-nonsense albums-most recently, Soul Monster (Delta Groove). TO-DOINGS: This fall’s unusually strong digital music beat goes on at UCSB, with tonight’s (Nov. 12) concert by the computer music program known as CREATE (Center for Research in Electronic Art Technology) at Lotte Lehmann Concert Hall. Dubbed Music Design, the show will include a rare nod backward in electronic music history, with a performance of 1991’s Gendy 3, by the late Greek legend Iannis Xenakis (who appeared at UCSB many years back). Also on the program are new pieces by the generally fascinating computer music composer Curtis Roads (currently the associate director of CREATE, founded by director JoAnn Kuchera-Morin in 1986) and Parisian composer Horacio Vaggione. CHINESE ROCK: On Friday evening, across the way at UCSB’s MultiCultural Center, the fall world music concert series will be capped off with Melody of China. Formed in San Francisco, the group is dedicated to the preservation and presentation of traditional Chinese music and indigenous instruments, but with an ear for contemporary compositions as well.